Cala D’or is situated in the South-East of Mallorca and is a very popular holiday resort for all nationalities most especially the British and Germans as this is an area that has not been built up with high rise buildings which destroy the natural environment of the island. The majority of the properties are built on two floors although there are those of three. The villas and apartments have been built in the Ibiza style surrounded by gardens with pines and local flowering shrubs. The construction in Mallorca has been growing constantly, most especially in the South-East of the island. Thanks to the local normatives in Cala D’Or it has not been possible to build in great volume. 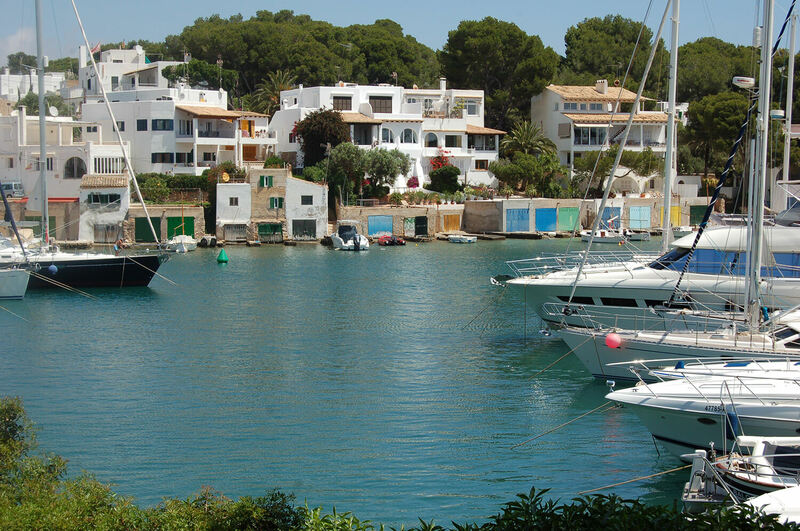 Cala D’Or offers a great variety of entertainments for families on vacation such as tennis, scuba diving, boating, restaurants, pubs, bars discotheques and a luxury marina. Founded by José Costa in 1932. He bought the land surrounding the five bays with the idea of building an urbanization which would be all white and built in the Ibiza style, reminding him of his “homland”. The church, Santa Maria del Mar is well known for it’s Ibiza style. Cala D’Or is considered to be one of the most modern tourist areas in Mallorca. If you wish to make a secure and sure investment do not hesitate to purchase a property in Cala D’Or, a quiet, charming place where you can either find a holiday or second home for all year living. All the houses are white and low such as those found on the island of Ibiza which makes Cala D’Or unique to Mallorca. You can find our office in Cala D’Or at the Plaza Ibiza nº 30 where we will give you the best service available for the sale or purchase of your property. Surrounding the marina there one can find villas and apartments for sale, many with views over the harbour. There are also newly built properties, mainly apartment blocks with modern design, but still in keeping with the natural surroundings which is so impotant to the locals, residents and visitors. 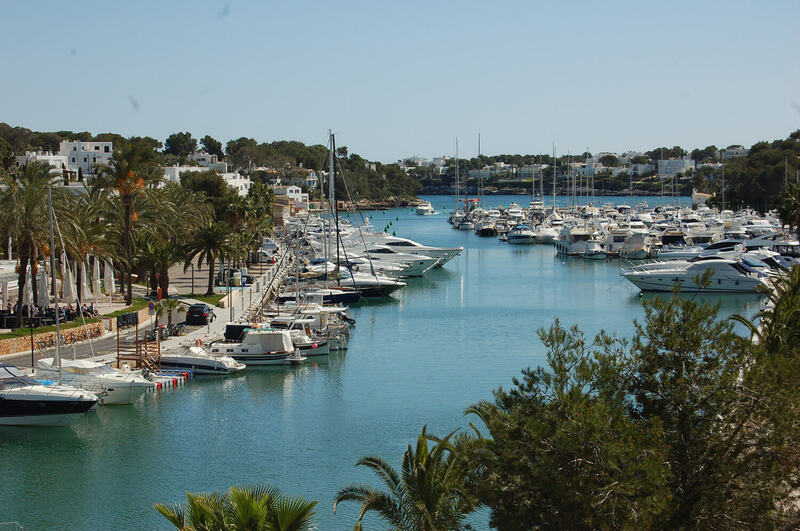 Known as the Marina de Cala d’Or, Puerto de Cala d’Or or Cala Llonga, this is a sports port situated in one of the oldest urbanizations of Mallorca. Actually possessing 563 moorings, two platforms with travel lifts with a capacity of 50 to 65 tons. Around the port you can find apartments and villas for sale, most of them with views to the Marina. There are also new constructions, mainly apartment bloques in modern designs, but maintaining the visual aesthetics of the surroundings, which is of great importance for visitors and local residents. Surrounding the marina there one can find villas and apartments for sale, many with views over the harbour. There are also newly built properties, mainly apartment blocks with modern design, but still in keeping with the natural surroundings which is so impotant to the locals, residents and visitors. Es Forti is an up-market residencial area with luxury waterfront properties, villas situated front line to the sea and small apartment complexes second line to the beach of Es Forti and the bay of Sa Galera. The area is very peaceful and is within walking distance to beaches and the shopping centre of Cala Egos. The fort in Es Forti was built to defend the coast from the many and different invaders that came to Mallorca over the years. It is open to the public and can be visited easily as the doors are open. From the fort there are wonderful views over the sea to the various bays in the area. The fort was built in 1730 during the war and was built in stone. The construction is very interesting and well worth seeing. Our office is in Cala D'Or in the Plaza Ibiza nº 30, we have properties for sale in Es Forti and will be happy to help you find the one you are looking for or sell the one you have. The urbanization of Cala Egos is much visited by tourism coming both from residents on the island and from abroad. It is a charming quiet and secluded area where one can fin peace and quiet although there is also a commercial area with restaurants, bars, cafeterias, pubs, shops and a variety of hotels. The residential area is very tranquil and the new build area of apartments and complexes is in a newer area due to demand. Many holiday makers either return to Cala Egos for further holidays or invest for their future here. Cala Egos has a beach of the same name with fine white sands, peaceful blue waters and shady pine trees and is much enjoyed by both residents and holidaymakers. Nearby in the area of Es Forti there is another little rocky bay known as Cala de Sa Galera. Cala des Pou, in Es Forti, from where one can see the light house is another charming beach in this area, here also the sand is fine and white, the waters blue and the shade from palm trees shelters one from the sun. There is a small bar-cafeteria on this beach for eating and drinking and enjoying the views. Further away, towards Porto Petro there is a further beach known as Cala des Llamp or Cala Llamp. This is an up-market residential area with elegant water-front villas that surround the headland. Most of the second line houses and even some third line one's also boast sea views. Cala Esmeralda received this name due to its marvellous and breathtaking transparent emerald coloured waters. The bay is well cared for and the pine trees surrounding it offer plenty of shady areas. The urbanization of Cala Esmeralda is totally residential, quiet and secluded area but within walking distance to the centre of Cala D'Or with all it's shops, restaurants, beaches and where you can find our office where we will give you the best service for buying or selling your property. This urbanization called Cala Serena is situated in a quiet residential area with an ample coastline with houses with gardens that reach almost to the waters front, steps into the sea and bathing platforms and naturally beautiful sea views, here you can find quality residence and quiet location. Exclusive luxury villas situated in the most idyllic setting in the whole of the Balearic Islands. Some properties in Cala Serena offer panoramic views of the Cala and the mountains of San Salvador. The houses have a Ibizan Style. There are only two or three apartment complexes some with sea views. Cala Serena has a charming little beach that is within walking distance to all of the properties in this urbanization. Cala Serena is a small cove with a charming little beach, surrounded by villas belonging to the urbanization of Cala Serena to one side and the long standing but newly renovated Club Robinson to the other. Due to it's situation you can find boats visiting the cove in summertime without disturbing the beach visitors. The christal clear water allow for scuba diving or just watching the subaquatic life moving around below you from your perch on the rocks. 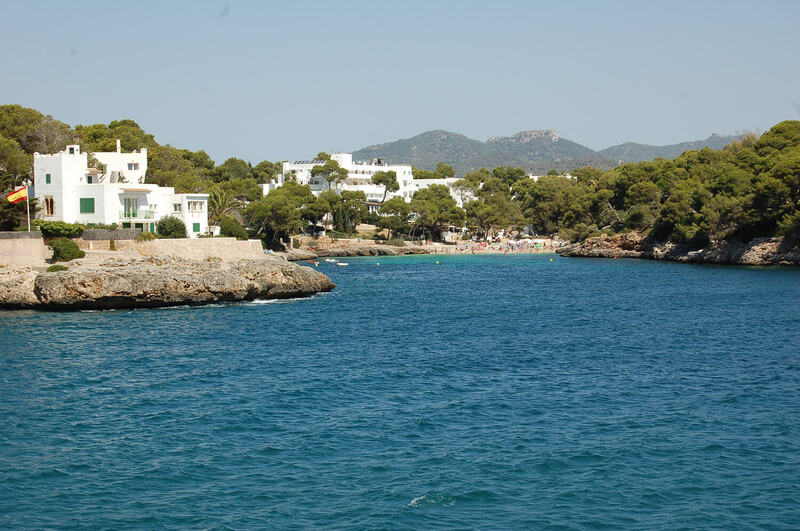 The more touristic centers of Cala Ferrera and Cala D'Or are near by as is the lovely beach of Cala Sanau. The urbanization Cala Ferrera and it'ds beach with the same name was founded in 1966, it was then surrounded by beautiful almond trees flowering in springtime and pine trees. 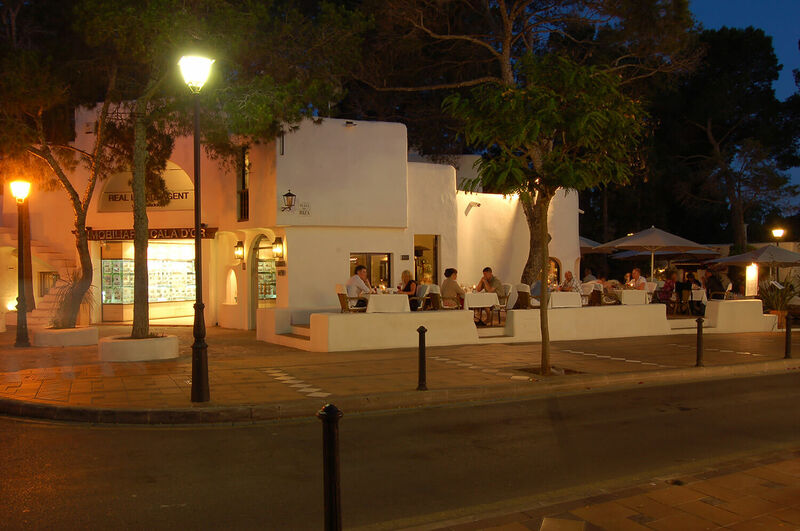 The buildings are white coloured, in Ibiza style, being characteristic for Cala d’Or. Near to the beach you will find hotels, restaurants, bars, shops and a little park for childrens entertainment. Due to its services of showers, toilets, sunbeds, parasols, public telephones, changing rooms, beach cleaning, waste bins and a very good security which can count on a Red Cross office, very good signs and the quality of its waters makes the Cala Ferrera beach worthy of receiving the blue flag. This beach is situated between Cala Serena and Cala Esmeralda. It is very special for its views to the sea and to a small island named “la cima de Puig”. It is the last cove of the Felanitx area where Santanyí begins. The coast of the Cala Ferrera beach is surrounded by rocks and pine trees.